Eaton and Baker on the set of "Masterpiece." 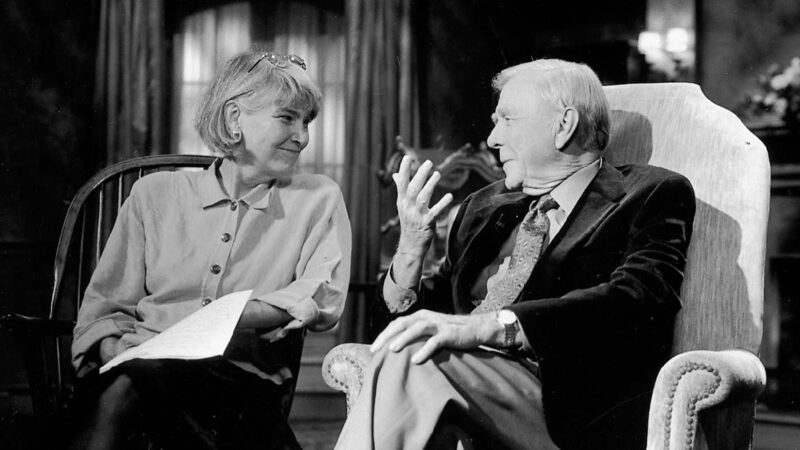 Renowned author Russell Baker, who died Monday at the age of 93, reached an audience beyond his long-running newspaper column as host of public TV’s Masterpiece for a decade. Rebecca Eaton, EP of Masterpiece, shares this remembrance of Baker. Russell always said he wanted to be the guy who followed the guy who followed Alistair Cooke as the host of Masterpiece. But he filled those shoes beautifully with his own all-American, literate and deceptively plain-spoken style. We loved him. He initially turned down the job when we approached him. In addition to that first excuse, he told me, “Only a fool or a suicidal maniac would take over from Cooke.” Interestingly, Alistair, too, had rebuffed the early invitations to host Masterpiece Theatre. He sent the executive producer off to pursue three other possible hosts, all of whom were dead. Which he knew. In both cases, Alistair’s and Russell’s, it was their families who convinced them to say yes. Apparently, Russell’s daughter Kasia warned him that if he didn’t take the job, he’d end up in his basement office, writing New York Times columns for the rest of his life. A damp, dark fate. We enjoyed Russell’s professional company for 10 years, from 1993 to 2004. He introduced 106 programs. Several times a year, he’d fly up from Leesburg, Va., not far from the town where he was born, to the WGBH studios in Boston. He charmed everyone — the director, the lighting crew, the stage manager, the makeup person. He loved the sense of community — probably in contrast to his lonely basement. He found his television work odd, interesting and entertaining. He had to adjust to expressing big ideas and lots of plot information in very few words. “It’s like doing a ballet in a phone booth,” he famously, and frequently, said. And he struggled mightily to keep his hands still. Whenever he would read from the teleprompter, his hands would get restless and move around, trying to type. They seemed to remember his early years as a daily journalist, on deadline. We tried everything to convince Russell to keep them still — stern instructions, a book to hold, duct tape. In between takes and during lighting changes, he’d stretch out his long legs and tell us great stories about duplicitous characters in Washington politics, then and now, and the plots of his favorite Hollywood movies. He could do a perfect John Wayne walk. He said, when he retired, that hosting Masterpiece had been a second college education for him. It required him to re-read all the great British classic novels — Bleak House, Jane Eyre, Daniel Deronda, etc. — that he realized he had misunderstood as a callow young undergraduate at Johns Hopkins University. Today, at Masterpiece, we are remembering his writing gift, his lovely low voice, his chuckle and grin when something struck him as amusing or ironic (often) and his deep generosity of spirit. He was an American democrat, a man of the people, set in the midst of the best of British drama. And we thank him. Eaton has been at the helm of the PBS strand for 31 years of its 45-season history.